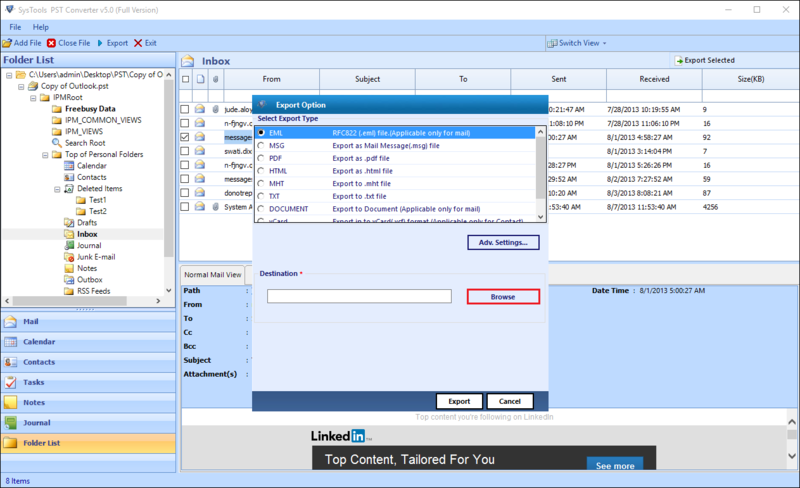 Outlook PST Export software allows to convert PST to EML, MSG, PDF, VCF, RTF, DOC, DOCX, TXT, MHT, ICS & HTML file formats. PST File Conversion tool migrate Outlook PST data file items like emails, contacts, calendars, tasks, journal and notes efficiently without any data loss. It supports to convert corrupted & password protected PST files. The PST converter allows conversion of all the items like emails, calendars, contacts, notes, tasks, etc. 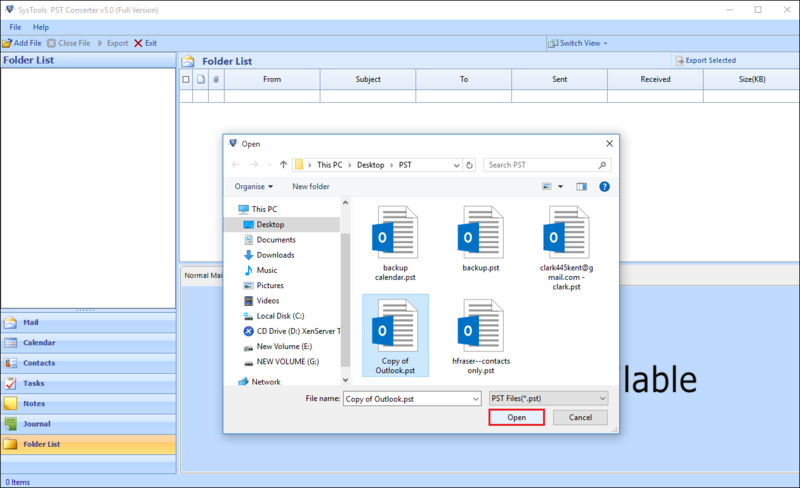 from Outlook PST file into multiple file formats. Also, it is capable of converting the data files from corrupted or password protected PST file without any inconvenience. The tool helps to support all the file formats such as EML, MSG, PDF, VCF, RTF, DOC, DOCX, TXT, MHT, ICS & HTML accordingly. 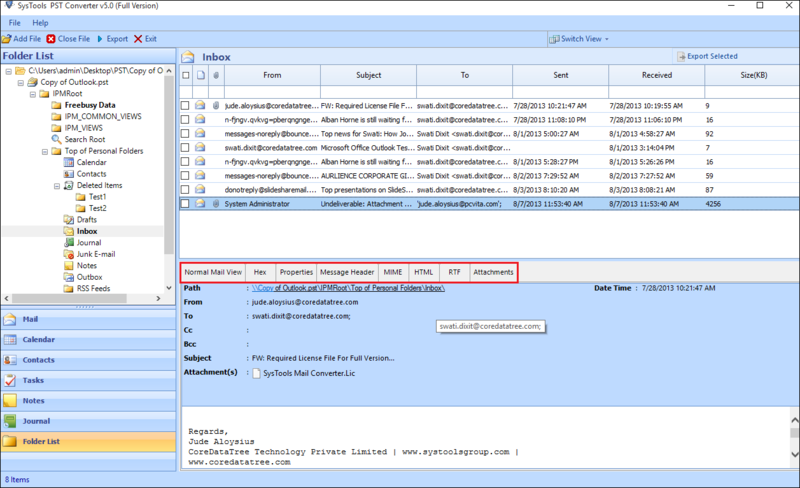 Moreover, PST emails are converted into EML or MSG and Outlook PST can be exported into PDF with its attachments embedded. 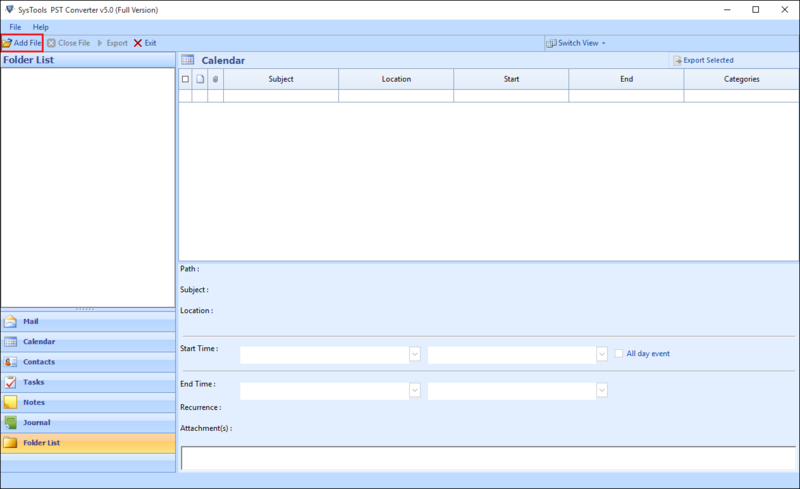 The tool will move each Outlook contacts as the vCard format. Outlook PST converter provides the option to export only the particular items or all the data from the PST file by selecting or deselecting the files and export it into any available formats. Also, the software will only save the selected PST files in the chosen output format. The PST file conversion tool will quickly scan the PST data and then, gives the preview of all the data items present in it. Once a user can click on any desired email, it will load the entire content and create the instant preview to see the details of the mails like Subject, Location, email address, etc. After scanning, the user can re-arrange all the data files including emails, contacts, calendars associated with the properties. 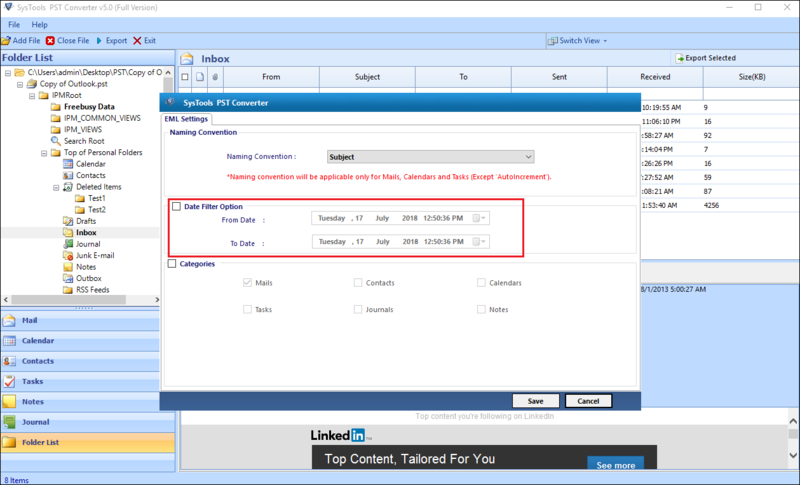 Suppose users have mentioned the dates to filter the emails while converting PST file using Mail Filter option. 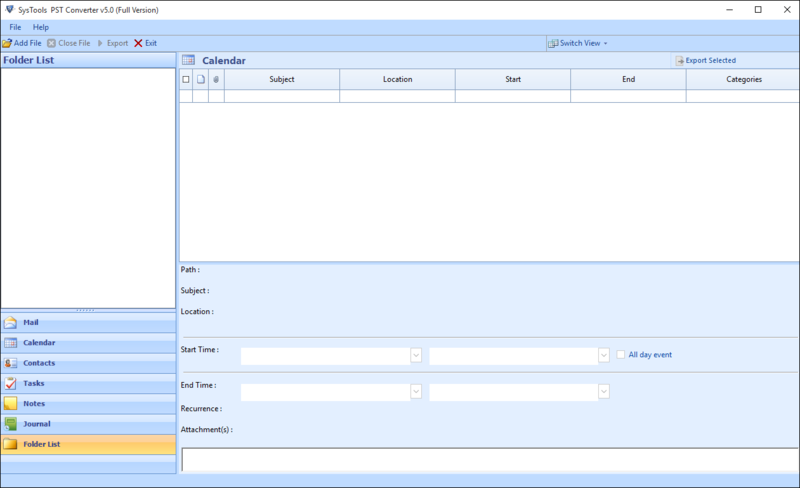 The tool will transfer only those emails that are within the range and on the specified date. It is useful when we have large PST file. The software provides appropriate file naming pattern that is applicable for EML, MSG files. Moreover, it allows multiple naming options of several emails according to the patterns like DD-MM-YY, MM-DD-YY, and Subject+ From permits a user to distinguish the emails accurately. How to Work With Outlook PST Repair Software? Step 1 : Start » All Programs » SysTools PST Converter » SysTools PST Converter to initialize the software. 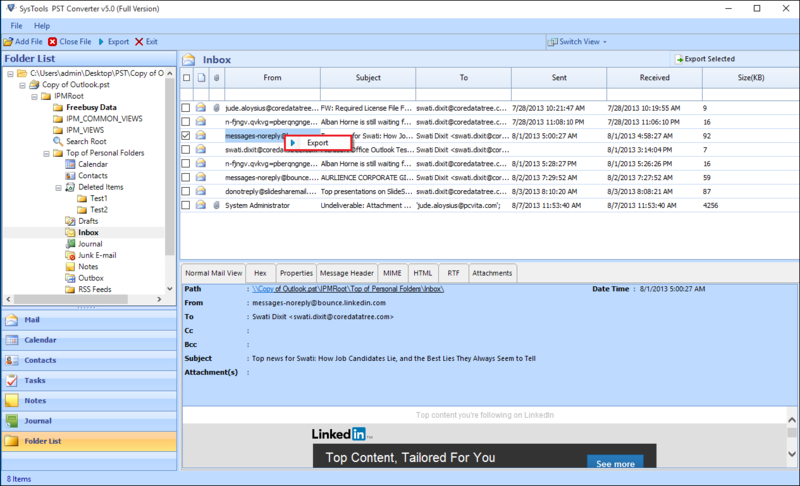 Step 3 : Then, a window will display to browse the Outlook PST file location. If your PST file is badly corrupt, then check 'Advance Scan' option. Then click on the, Add File button. 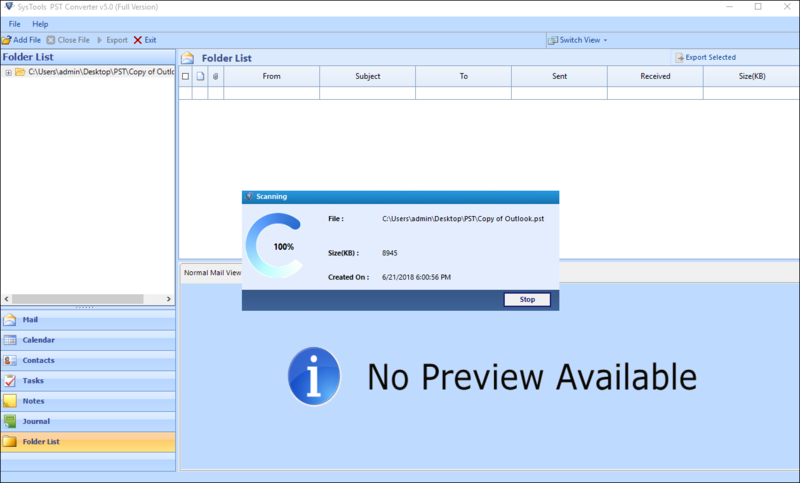 Step 4 : Choose one PST file from the folder & click on the Open option to open the selected PST file. Step 5 : The screen displays the file is being scanned. It displays details like: name of .pst file, size in KB, & the file creation date. 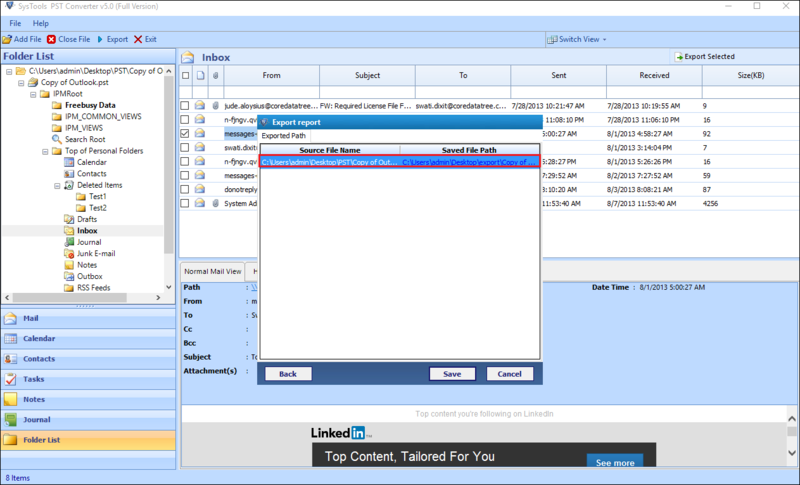 Step 6 : ow, the PST converter loads the PST file and creates a preview of the emails. Users can see the loaded emails in different mode like: Normal Mail View, Hex View, Properties View, Message Header View, MIME View, Email Hop View, HTML View, Attachments & Hierarchical View. Click on the Normal Mail View tab to preview the PST email body. Step 7 : To export the selected PST emails, simply choose the emails, right click on it, and choose the Export option to export the selected file. Step 9 : For Example, Convert PST to EML format. Choose EML file format from the list of file format supported. 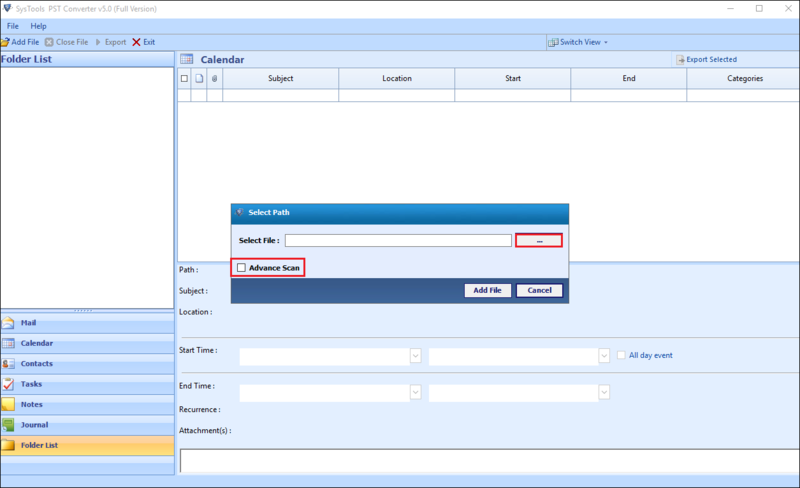 Mail Filter: Apply Email Filter for exporting outlook emails of a particular date rang. Naming Convention: Choose the PST file Naming Convention to save the file with a suitable naming. Step 11 : Then browse Destination: Select the PST destination location for saving the exported PST files. Step 12 : Finally, click on the Export option to begin the process. Step 13 : As the PST export process begins, the following window will showing the whole process. Click Ok, when process completes. Q. Can your software converts corrupted or password protected Outlook PST file? "Recently, I am having a single PST file, which contains necessary emails and contacts but the availability of the older version of Outlook i.e. Outlook 2002. Therefore, I want to know that still can I migrate it using Pst converter tool?" Ans: Yes, Outlook PST Converter is an efficient tool and it allows converting corrupted or password protected PST file effortlessly. Q.Is your Outlook PST Converter tool support Windows 8.1? Ans: Yes, the software is a Windows-dependent application which involves Windows 8.1 and all below version. Q. Is your software able to convert my Outlook mail in PDF document? Ans: Yes, PST conversion tool allows to convert emails, contacts, calendars, and other data files of PST into MSG, PDF, vCard and EML format without any hassle. Note: PST Converter Software will get delivered on your registered email id, within few minutes after placing the order. Outlook PST converter is an amazing tool because it can migrate all Outlook items into multiple file formats like EML, MSG, PDF, VCF, RTF, DOC, DOCX, TXT, MHT, ICS & HTML format without losing a single bit of data. 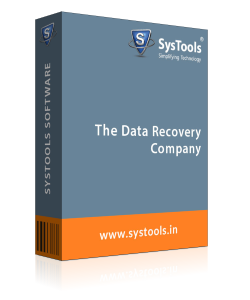 This software is a reliable conversion tool that allows the user to convert the corrupted or password protected PST file into the desired format. In fact, I am going to suggest this amazing tool to my colleagues and relatives also. Thanks for developing such a great product. Yesterday, I have faced a lot of trouble when I was taking out 200 contacts but luckily got this PST converter tool. 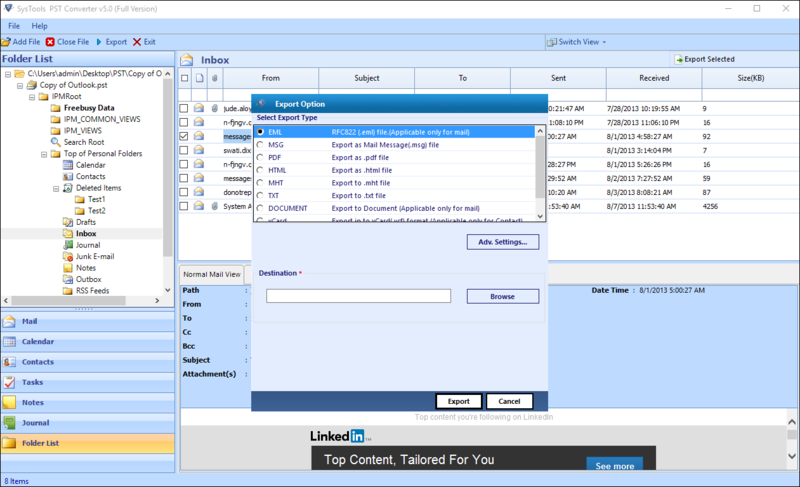 It provides a facility to store Outlook contacts in vCard formatting without any difficulty. Meanwhile, this tool provides Mail filter option when we have large PST files during the conversion. I must say, this tool is very user-friendly, efficient and reliable for the conversion. Thanks a lot!